I just received a very convincing email that pretends to be a subpoena from the US District Court. This is an extremely crafty email and the most realistic scam I have seen yet. However the poor souls who visit the court site will receive a nasty surprise. Using Internet explorer, this site will download spyware and malware into your computer. 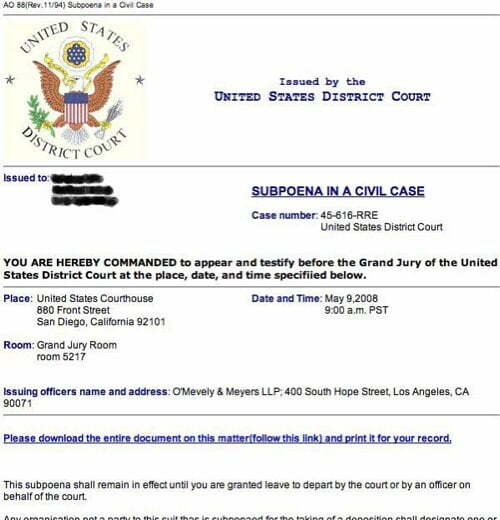 This subpoena shall remain in effect until you are granted leave to depart by the court or by an officer on behalf of the court. If you see this email, immediately report it as spam. Read more from the NY Times and Ed Moed. i tihnk the above comments from this chinese outfit are outrageous. Im very blown away these ISP’s continue to allow spammers to setup shop on their servers. Is there a way to try out a trial? It is kind of a whaling attack targeting big fishes in corporate offices like CEO’s, top executives and managers. “uscourts.com” mentioned in email. So Beware of these kinds of mails. The Abaca Email Protection Gateway (http://abaca.com/) service was the only service I know that quarantined these emails.